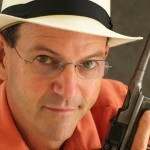 As the debate over gun-control heats up, David chats with Dan Baum about his book Gun Guys: A Road Trip. A supporter of gun rights, Baum is a bit of a rarity not because of his views but because he is a liberal Democrat. Rather than making standard party-line arguments, this book points the finger at both parties showing their shortcoming when coming to handling gun control arguments.